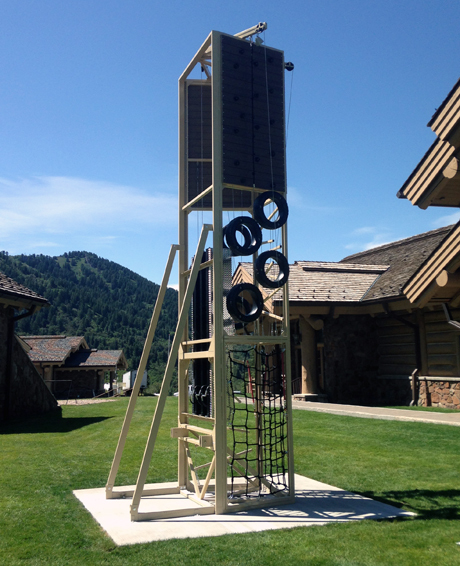 The Climb-N-Challenge™ is a hybrid between a rock wall and a ropes course. We call it a vertical ropes course because you climb upwards over a series of challenge course elements. The experience is fun, challenging, and completely new to most participants. It challenges them to think, “How am I going to get over these obstacles?” and then they have to go for it! The vertical, free-standing design makes it very compact. It can be installed indoors or outdoors. The Climb-N-Challenge™ has 3 distinct sides or routes. Each route climbs upwards over 3 obstacles. You can mix and match the obstacles on each route to create a completely custom experience. Even more exciting, this tower gives you flexibility to change out obstacles in the future or add our traditional Modular Panels or new Klime Wallz™ to the tower. You are in essence buying a platform that can be updated as often as needed to keep the experience fresh for your patrons! Tremor Ladder: A ladder that is made out of 1½” tube steel spaced unevenly, on angles, and hanging loosely to create more of a challenge. We can customize the difficulty of this obstacle to meet your objectives. This is the perfect element to place on the first 8′ of an easy route. Cargo Net: A classic climbing challenge that is always more difficult than it first appears! This is another great element to place on the first 8′ of the route. Tire Climb: Plastic tires are arranged to create a visually striking climbing challenge. We can assemble 2-4 tires depending on the desired level of difficulty. Regardless, this challenge requires some non-intuitive body movement to get up-and-over obstacle! The Wall: You’ve likely seen a similar challenge on mud runs and other obstacle courses. Use the rope to pull your self up the wall or make good use of the climbing handholds. This can be as challenging as you like. Our wall is built from high-wear, weather resistant Trex™ decking to ensure many years of service before replacing.